This necklace grew out of testing the instructions for my original Peyote Bobbles Necklace. I also wanted to see if by playing around with the beads i.e. using cubes instead of size 6s, I could alter the whole look. Along with mixing up the beads, I also altered the placement of the bobbles, with less space between them, and added an integral beaded fastening. This adapting of a piece is something I love to do. Once I have learnt or developed something I want to get as much mileage out of it as I can. I am also constantly inspired when beading something to see how it would look if I did something different. This is why a lot of my work runs in series. I also try to do this with what I teach so that if I show you how to do something, I also show you ten other things you can do with it as well! 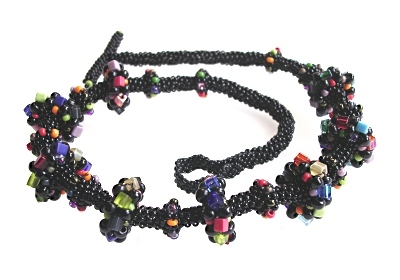 After the book with the original necklace was published, Liz Thornton, co-editor of the book and then editor of The Beadworkers Guild journal, contacted me about writing an article on the development of the idea, which led me on to bead further items.